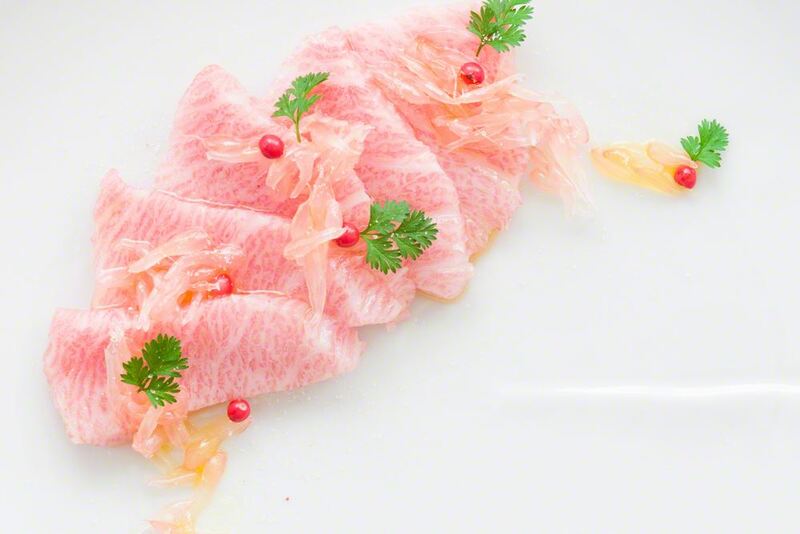 Great ingredients taste best when prepared simply and ootoro is no exception, with it's pastel pink color and rich, creamy texture it's truly one of the most luxurious cuts of fish. This crudo's simple preparation belies its complex array of tastes, textures and flavors. 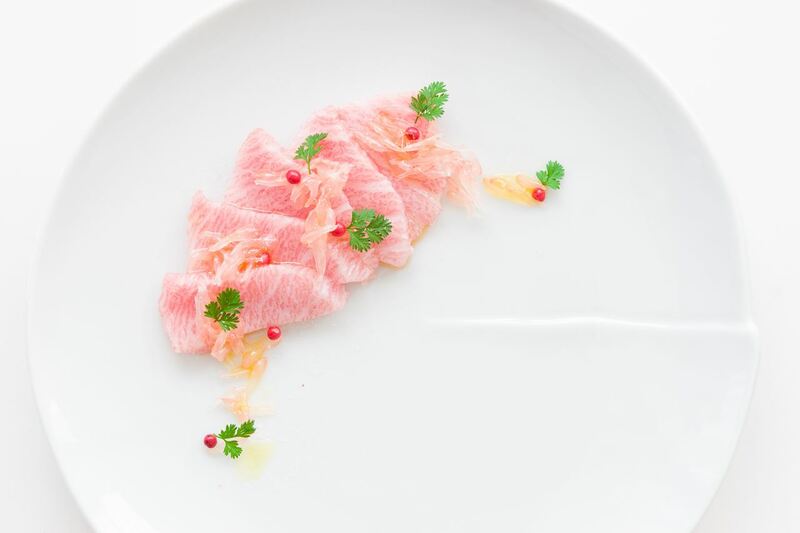 With thin slices of ultra-marbled otoro that melt in your mouth, accented by tart and bitter grapefruit caviar, savory pink salt, sweet peppery pink peppercorns, and anise flavored chervil, it somehow manages to be decadent and refreshing, all in one bite. Because of the amount of fat in otoro, the exterior fries up crisp like bacon, while the interior melts like butter into a decadent, creamy morsel of tuna. Seasoning the cubes of tuna with mojio (sometimes transliterated moshio), an ancient Japanese salt, is the trick to making the otoro so flavorful. That's because mojio is made by boiling seawater with kelp, giving it a light beige color and loads of glutamates, which stimulate the umami taste buds on your tongue. 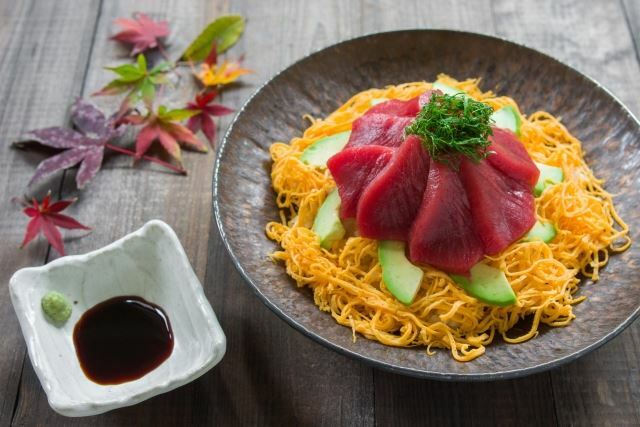 The potent fresh wasabi helps offset the richness of the tuna, giving each bite some fresh horseradish notes, while the fried garlic chips imbue a complex umami and sweetness. When cutting the tuna, if you want them to be perfect cubes, be sure to start with a piece larger than 200 grams so you can trim it to the correct shape, the trimmings make great sashimi. 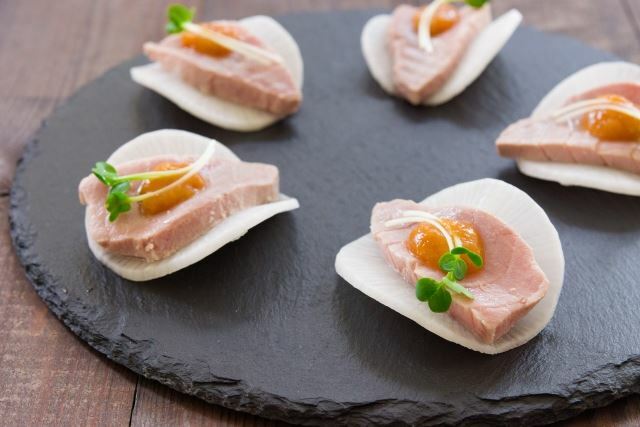 This easy one-bite canapé comes together in a matter of minutes, but its simple looks belie a symphony of tastes, aromas and textures. By lightly poaching the chutoro in a dashi stock, it not only infuses the tuna with smoky umami, it also renders some of the fat in the tuna making it melt-in-your-mouth tender. 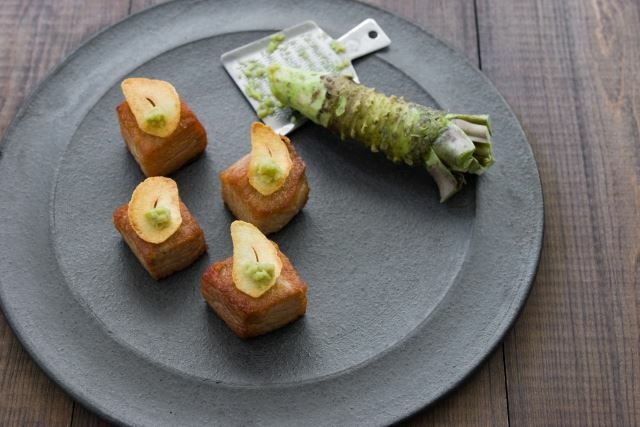 Served atop a crisp round of daikon adds a contrasting texture as well as a sweet peppery taste, and the sweet, tangy miso sauce not only seasons the bite, it also gives it the marvelous citrusy fragrance of yuzu. 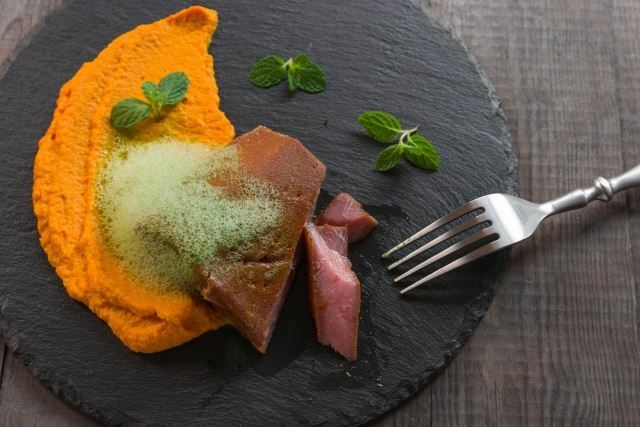 In this North African inspired dish, the chutoro (medium fat tuna belly) is brined before being dusted in ras el hanout and cooked sous vide. At 115 degrees Fahrenheit, the tuna is still pink and retains some of its firmness, but the fat has started to melt, giving it a moist juicy texture like a great piece of wagyu. 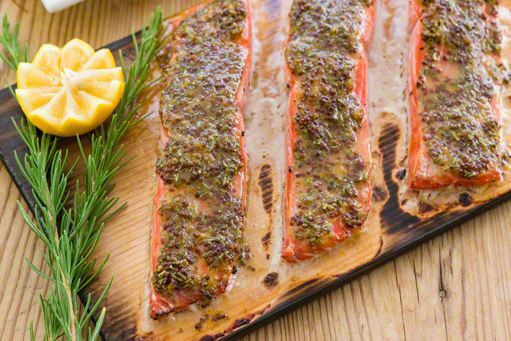 Served over a sweet roast carrot and fennel puree, along with a ginger mint air, this fragrant, colorful dish includes all the vibrant flavors of a Moroccan souk. Rolling a balanced maki-sushi or crafting a perfect bite of nigiri-sushi can take a lifetime of practice, but here's an easy low-effort way of enjoying sushi at home. Chirashi-sushi (literally "scattered sushi"), refers to a type of sushi where a bed of sushi rice is adorned with fish, vegetables and eggs. In this simple take on the classic, a bed of sesame seed studded sushi rice is covered in a cheerful layer of kinshi-tamago (golden egg threads), rich creamy avocado, and velvety bluefin tuna that melts in your mouth. It's a one-plate sushi meal that's gorgeous to look at, and a treat to eat.